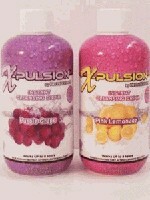 Passion Splash Berry & Twisted Lemonade 16-ounce Bottles. Max Weight 250lbs. 3 hours before consuming, stop smoking cigarettes. 2 hours before sampling, drink entire bottle of X-Pulsion. 10 minutes later drink 32-ounces of water. Urinate 3 to 4 times.